ation calling for every Tuesday to be meatless and for one meatless meal to be observed every day, for a total of nine meatless meals each week. To encourage Americans to ration their edibles, the United States Food Administration thought up the slogans “MEATLESS TUESDAYS” and “FOOD WILL WIN THE WAR” (dang, why didn’t we think of that). 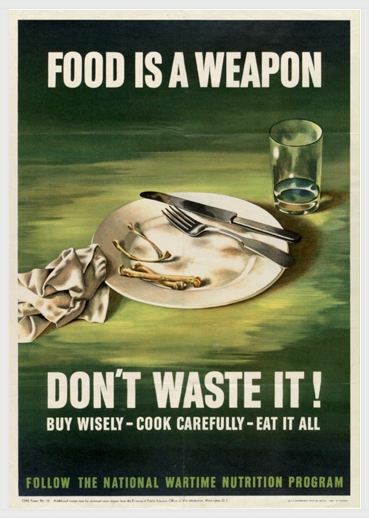 Again in WWII Americans banded together and cooked yummy vegetarian meals for their families every week in order to conserve commodities in wartime. Slogans like “FOOD IS A WEAPON, DONT WASTE IT” and concepts like victory gardens became a national initiative. Since then Meatless Mondays have become an international practice. Many cultural institutions including Mario Batali, Oprah, Epicurious, Al Gore, Wolfgang Puck, San Fransisco Board of Supervisors, and Sodexo have jumped on board with official meatless days and “flexitarian” living. In fact Meatless Mondays has since blossomed into its own international non-profit initiative! A report by the American Meat Institute in February 2011 found that 18% of American households now participate in Meatless Mondays. Today we have lots of very important and very complicated issues as Americans. The issue of our environment and the drought in California is a major issue and Im confident we can fix it. We have made resolutions throughout our history as a great nation to overcome the odds, and if our own history is any evidence, we can do it again. Yes, I get a bit of spam, but I just mark each of them as spam. I have not looked into getting a plug in for that, but that is a good idea. Thanks regarding giving these sort of good subject material. know about it, Thanks a great deal. I just want to say I am newbie to blogging and site-building and absolutely enjoyed this blog site. More than likely I’m going to bookmark your blog post . You definitely come with exceptional stories. Thank you for revealing your webpage.